Size: 5.8" x 3.1" x 1.8"
This ROOT-8S calculator was introduced in 1973 and is one of the few Casio calculators based on Texas Instruments technology. 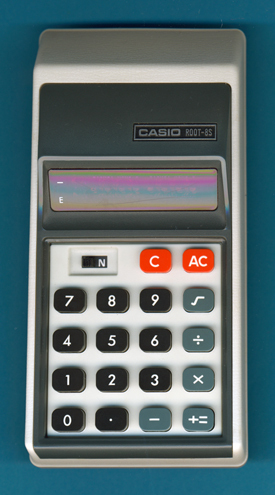 Most early Casio calculators - including the Mini CM-601 - are based on Hitachi chips, some on NEC chips but as of today we know only two calculators with TI chips. We know the TMS0126 "calculator-on-a-chip" located in this Casio ROOT-8S manufactured end of 1973 already from the Canon LE-80R. Canon, in contrast to Casio, developed already in 1969 a long-lasting relationship with Texas Instruments, please remember the legendary Pocketronic basd on the technolgy developed with the Cal-Tech project. The TMS0126 single-chip calculator circuit is similiar to the TMS0120 developed for the SR-10 and introduced almost one year earlier.